Panasonic’s Lumix GM1 is a small but powerful camera that cunningly succeeds in two different markets: first it’s the World’s smallest mirrorless system camera, packing the quality and many of the features of the high-end Lumix GX7 into a much more portable body, and secondly it’s a compact for enthusiasts which confidently takes on the best of the fixed lens models including the Canon S120 and Sony RX100 II. 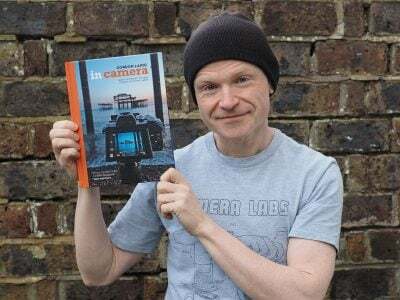 As such it appeals to a broad range of photographers, both those looking at smaller interchangeable lens cameras and those weighing-up high-end compacts which are a step-up in quality over point-and-shoot models. Written down it sounds like Panasonic has scored a coup no-one else has thought of, but really the GM1 simply fulfills the promise of mirrorless system cameras when they were first introduced several years ago – namely to deliver DSLR quality, control and interchangeable lens flexibility in a smaller body. Over the years many of the more capable mirrorless system cameras have ironically grown in size and weight to deliver the look and feel of smaller DSLRs, but the GM1 unashamedly embraces the original concept and surely pushes it as far as it can go in this format. Panasonic’s engineers are certainly to be congratulated on packing so much into something so small without losing usability, and particularly for not removing features simply to differentiate it within their range. On the contrary, the Lumix GM1 delivers much of the GX7’s powerful feature set and I’m pleased to report most of the things which were left out were necessary physical omissions in order to achieve the compact dimensions. So how much is different from the GX7 then? Most obviously the GM1 lacks its tilting electronic viewfinder, the tilting screen, hotshoe and built-in stabilisation. The smaller body also has much less to hold onto and fewer physical controls. So far, this is all understandable given the difference in size. For me though the more interesting aspect is the software within the camera, as this is where Panasonic has virtually replicated the GX7’s electronic feature-set, with the absence of adjustable tone curves and a panorama mode being the most notable differences. I’m not sure why tone curves were left out when pretty much everything else was left in, but the removal of the panorama mode hints at some of the compromises necessary when implementing such a small body. There’s no official explanation, but I understand a number of features were skipped or reigned-in to prevent overheating of the sensor – after all there’s not a great deal of body around it to disperse heat. So along with no panorama mode, there’s also no 1080 video at 50p or 60p and no exposures longer than 60 seconds either. But let me put this into perspective. The GM1 may not have 1080 video at 50p or 60p, but it does offer those frame rates for interlaced video, and more importantly for film makers there’s also 1080 at 24p. In fact the GM1 is a fantastic movie camera for enthusiasts, sporting focus peaking that’s active while filming, full manual exposure control with PASM modes, silent touchscreen control over exposure and focus, touchscreen focus-pulling, and powerful timelapse facilities. It may not have a microphone input (although neither did the GX7), but it remains a very capable video camera, and its tiny size lets you squeeze it into places where you wouldn’t normally be able to mount a movie camera. As for long exposures, there may be no Bulb, but the kit lens – not to mention most other Micro Four Thirds lenses – feature proper filter threads, allowing you to mount Neutral Density filters much more easily than on rival enthusiast-class compacts. During my tests with the GM1 I fitted my LEE Big Stopper and made 15, 30 and 60 second exposures, and while the longest did include a sprinkling of hot pixels, the half minute ones looked fine – you can see one here and the others on my sample images page. The bottom line here being that even with limitations on the longest exposures, it was actually much easier to do long exposure work on the GM1 than models like the Sony RX100 II. At the other end of the exposure range, another interesting ‘compromise’ of the small body is the use of an electronic shutter at exposures above 1/500. Due to space limitations, Panasonic’s engineers implemented a stepper motor to drive the shutter to speeds up to 1/500, after which an electronic shutter takes over for speeds up to 1/16,000. 100% electronic shutters enjoy the benefit of completely silent operation – and indeed if you like you can switch to an electronic shutter for exposures slower than 1/500 if discretion is important – but they can also suffer from rolling shutter artefacts where subjects in motion can appear skewed. This particularly affects vehicles in motion or people running. I extensively tested the GM1 at speeds between 1/500 and 1/16,000 for action photography and thankfully found little evidence of skewing, although that could equally have been a lucky choice of subject. What I did find though was the GM1 made a fantastic little action camera with a top shutter that can freeze even the fastest action in its tracks, and usable burst modes too. The bursts may not be as long as the Canon S120, but the top shutter allowed me to freeze action which was out of reach of most cameras, such as the jetski pictured here. In terms of the features inherited from the GX7, the GM1 boasts powerful timelapse and stop motion capabilities which go beyond those on the Olympus EM1, seven frame AE bracketing in 1EV increments, built-in Wifi and fast AF that works well in dim conditions. It’s well worth expanding on the last pair. Many cameras with Wifi only offer image transfer or basic remote control, but the GM1’s free Lumix Image App for iOS and Android devices supports full manual exposure control and wireless triggering of movies, brackers or timelapse sequences. Meanwhile the AF allows it to be used in conditions under which most cameras experience problems. The GM1’s AF works at light levels down to -4EV which is much lower than rival compacts and indeed most system cameras and DSLRs. This means under dark conditions when most camera’s AF systems hunt endlessly or force you to manually focus, the GM1, like the GX7 and G6 before it, simply gets on with the job. It allowed me to easily focus for night city scenes and on friends and family in dim interiors at times when the Sony RX100 II really struggled. And if you do want to manually focus, there’s not just magnified assistance, but focus peaking that remains active during movies too. The GM1 also inherits the GX7’s image quality, which is up there with the best of the Micro Four Thirds models. In my tests this makes it as good as APS-C models at all but the highest sensitivities. Crucially when considered as an enthusiast compact, it also allows it to out-perform models like the Sony RX100 II and especially the Canon S120 on resolution and noise at the same ISO values. If it’s beginning to sound like a slam dunk for the GM1, you’d be close, but there are a number of issues and annoyances I found during my weeks testing it. I’ll start with the image quality, which may out-perform rival compacts when both are using the same ISO values, but if you’re using the 12-32mm kit zoom, the camera will be forced to use higher ISOs than the RX100 II or S120. The reason being the 12-32mm kit zoom is typically one to two stops slower in aperture than the Sony and Canon at the same focal lengths, allowing them to deploy lower sensitivities under the same conditions. So the GM1’s lower noise advantage only comes into play when you’re using lenses with the same aperture as rivals. Of course as an interchangeable lens camera, you’re welcome to untwist the 12-32mm kit zoom and fit any one of the models from the extensive Micro Four Thirds catalogue, including those with the same or even brighter apertures than the RX100 II or S120. But what should be the GM1’s major selling point over rivals faces problems in practice. First, the 12-32mm kit zoom is so small, almost any other lens will look and feel huge in comparison, in turn accentuating the modest grip. Now of course the GM1 would look silly with a 100-300mm mounted on the front – although you can if you want – but even compact primes like the Olympus 17mm f1.8 and Panasonic’s own 20mm f1.7 are a bit front-heavy. There’s the GM1 with the Olympus 17mm f1.8 opposite. Aha, no problem I hear you say: I’ll simply stick with the 12-32mm kit zoom for casual handheld snaps and mount the camera on a tripod when using bigger lenses. That’s a great idea if only the barrel of most lenses didn’t protrude below the bottom of the camera body and prevent it from being mounted on most tripods. I have a collection of six Micro Four Thirds lenses and I couldn’t use a single one on the GM1 when mounted on my small tripod, which really curbed its usefulness as an interchangeable lens camera in my view. The small body also inevitably results in some compromises in control and handling. I can forgive the absence of grip and multiple dials, but the wheel on the rear can be pressed far too easily when spinning it. Now this is the kind of thing you can get used to, but during my time with the GM1, I almost always accidentally pushed the wheel too hard when adjusting, say, the aperture, then found myself spinning through the White Balance presets instead. This isn’t a size issue either, it’s one of stiffness. I should note the Sony RX100 II’s rear wheel is much stiffer to press, preventing any accidental pushes, and its inset mode dial is also taller and easier to turn. With all that said it’s time to compare the GM1 to some rivals before my final verdict. Sony redefined what we could expect from an enthusiast’s compact with the original RX100 and enhanced it further with the RX100 II. Both models deservedly became best-sellers, but now the Lumix GM1 challenges that dominance, so how do they compare? Both bodies are roughly the same size when viewed from the front and pack larger sensors, 3in screens, 1080 movies with manual exposure control, built-in Wifi and focus peaking that works while filming video; they’re also roughly the same price. In its favour, the Lumix GM1 is an interchangeable lens camera which can take any lens from the extensive Micro Four Thirds catalogue. Its sensor is larger, allowing it to deliver lower noise levels when both it and the Sony are set to the same ISO value; in my tests the GM1 also resolved more detail. Its screen is touch-sensitive, allowing you to tap at the subject you’d like the camera to focus on for stills or during movies. There’s deeper seven-frame AE bracketing, powerful timelapse capabilities and the built-in Wifi supports a far more capable smartphone app which lets you remotely control exposure. The GM1’s autofocus also works under much dimmer conditions, making it more responsive both for city nightscapes and social interiors. Both cameras are quiet, but the GM1’s electronic shutter can be completely silent and also supports much faster shutter speeds up to 1/16,000, not to mention longer bursts than the RX100 II. You can also apply the popular miniature effect to movies. In its favour, the RX100 II has a body that’s 1cm thinner than the GM1 kit, allowing it to more easily squeeze into tighter pockets. 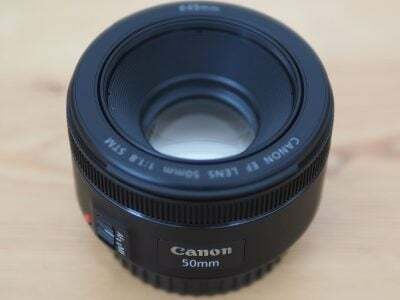 It comes with a built-in lens with a 28-100mm equivalent range that may not be quite as wide as the GM1 kit zoom, but reaches about 50% longer at the telephoto end. The RX100 II’s lens is also optically brighter than the GM1 kit zoom, typically by one to two stops across the same range, allowing it to use lower ISOs under the same conditions and erode any advantage of the GM1’s bigger sensor (at least when it’s fitted with the kit zoom). It has a tilting screen which makes it easier to compose at high or low angles and a hotshoe which supports external flashguns and microphone accessories; an additional accessory port also supports an optional called remote control. The best quality video is 1080 at 50p or 60p, there’s a panorama mode and you can recharge the battery internally over USB. The decision between them boils down to which features are more important to you. 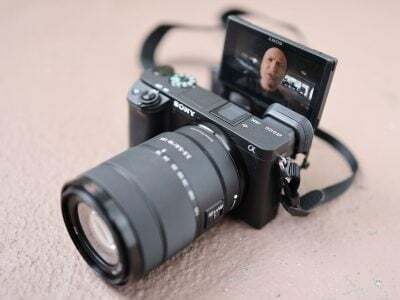 The Sony is definitely more pocketable and boasts a longer zoom as standard, a tilting screen and hotshoe, while the Panasonic has the benefit of interchangeable lenses, a bigger sensor, faster AF, a more powerful movie mode and a touchscreen. For me personally the benefits of the GM1 slightly outweigh those of the RX100 II, but having owned the Sony I know I could be very happy with either. See my Sony RX100 II review for more details. Canon’s PowerShot S120 has arguably been the compact to go for if you want enthusiast class features in a genuinely pocketable body. But if you’re willing to accommodate a thicker body, you could enjoy a much larger sensor and the benefit of interchangeable lenses. So how does the S120 measure-up against the GM1? Viewed from the front they share similar profiles, along with having 3in touchscreens, built-in Wifi and plenty of manual control. What about the differences? In its favour the Lumix GM1 boasts a much larger sensor with roughly four times the surface area of that in the S120, allowing it to maintain lower noise levels at higher ISOs and also resolve finer details. It’s an interchangeable lens camera which can take any lens from the extensive Micro Four Thirds catalogue. There’s deeper seven-frame AE bracketing, powerful timelapse capabilities and the built-in Wifi supports a far more capable smartphone app which lets you remotely control exposure. The GM1’s autofocus also works under much dimmer conditions, making it more responsive both for city nightscapes and social interiors. Both cameras are quiet, but the GM1’s electronic shutter can be completely silent and also supports much faster shutter speeds up to 1/16,000. The GM1 also offers full manual control over movie exposures. In its favour, the S120 is about half the thickness and sports a longer 5x lens range that starts at the same 24mm equivalent, but ends twice as long at 120mm; the S120 also maintains a brighter aperture at the same focal lengths as the GM1, allowing it to use lower ISOs, although the sheer sensor size of the GM1 still allows it to deliver less noise and shallower depth of field effects. The S120 can also shoot at its full resolution at around 10fps until you run out of memory and additionally offers 1080 video at 60p along with a couple of neat astrophotography presets. Finally the S120 costs roughly half the price of the GM1. So while the GM1 comfortably out-features the S120 and delivers better quality too, the little Canon fights back with a body that’s half the thickness, sports double the zoom reach and costs half the price. If you’re happy with its image quality and value a slim body above the GM1’s feature-set, then there’s still very compelling reasons to go for the Canon S120. See my Canon S120 review for more details. Panasonic’s Lumix GM1 is a very canny camera, appealing both to those who are looking for a small interchangeable lens camera and those who want a compact with better quality and features than a typical point-and-shoot. As such it takes on models like the Olympus PEN and Sony NEX cameras in the system market and Sony’s RX100 II and Canon’s S120 on the compact side. And impressively it actually manages to be compelling alternatives to both. The GM1’s secret is as much about inheriting most of the GX7’s internals as it is about squeezing them into the smallest possible body. It means the GM1 enjoys features normally lacking on a camera of this size, such as very quick AF that works in very low light, built-in Wifi with smartphone remote control, deep seven-frame bracketing, powerful timelapse facilities, manual control over movie exposures and focus peaking that works for video. Panasonic has squeezed all of this into a tiny body that manages to not only become the World’s smallest mirrorless system camera, but also one that’s only one centimeter thicker than Sony’s RX100 II. You’re not going to squeeze the GM1 into a tight pocket, but it’ll slip into almost any other and be hardly noticeable in a bag. The small size means the GM1 misses out on some of the GX7’s features – most obviously there’s no viewfinder, tilting screen, hotshoe or built-in stabilisation, and to avoid overheating it also lacks the panorama mode, 1080p video at 50p or 60p and exposures longer than 60 seconds. The small body also necessitated an electronic shutter above 1/500, but it’s silent, suffers from little skewing in my tests and supports speeds up to 1/16,000, double that of the fastest mechanical shutters in DSLRs and system cameras, and allowing the GM1 to freeze the kind of action that’s normally out of reach on a compact. Meanwhile the image quality is excellent, as good as the best Micro Four Thirds models and matching APS-C at all but the highest ISOs. There’s a lot to like here, although as noted above and throughout my review, there’s also some issues you need to consider. The light touch of the control wheel on the rear was a bugbear for me and even after several weeks use I’d still accidentally press it when trying to just spin. This meant what should have been a quick adjustment of, say, the aperture would launch me into one of the other menus with subsequent back-tracking to correct it. The battery life is fairly modest and I frequently found it running low before the day was out, although to be fair I was regularly shooting video, timelapses and using Wifi. But if the GM1 had USB charging, I’d have easily been able to top it up from my car or laptop without having to find mains electricity. Arguably the biggest issue concerns what should be its greatest benefit over rival compacts – the chance to mount other lenses. Yes you can fit any lens from the extensive Micro Four Thirds catalogue, but the body is not that easy to hold steady with anything but the smallest lenses mounted. You may not be able to use the GM1 on a tripod with them either as the barrels of most lenses extend below the bottom of the GM1 body, preventing the use of most plates. That said the 12-32mm kit zoom is so small, light and perfectly matched to the GM1, many owners will never take it off. But then they must carefully compare the zoom range and optical speed against the built-in lenses on rival compacts, at which point they’ll discover the Sony RX100 II and Canon S120 both zoom further and feature brighter focal ratios which eliminate some benefit of the GM1’s larger sensor. But during my time with the GM1, shooting alongside the RX100 II and more expensive system cameras, I was constantly impressed by the speed and low light performance of the AF system and its ability to take almost any kind of photo I wanted. When shooting friends or families in dim interiors, the GM1 would focus more confidently than the RX100 II, allowing me to quickly and easily nail the shot, and when I had time to myself I could indulge my creative desires to freeze the fastest action, capture timelapse sequences, grab deep brackets for HDR or long exposures with my ND filter set. This speed and sheer flexibility gives the GM1 the edge over rival compacts, not to mention many system cameras, and that’s even when equipped with the kit zoom; the fact you can swap lenses is the icing on the cake, even if it’s something you’ll rarely taste due to practicality reasons. The dual nature of the GM1 leads me to make two conclusions. As a system camera it’s certainly a lot of fun, but the minimal grip and issues with mounting on a tripod means you should think carefully about its practicality if you’re going to swap lenses regularly. Indeed if it’s going to be your only camera and you do want to swap lenses, then I think you’d be better off with a larger model like the Lumix GF6 or an Olympus PEN. If you’re considering it as a complement to an existing system camera though, it’s fine and I could see a lot of Micro Four Thirds owners adopting it as a portable backup. Where the GM1 really shines though is compared to rival enthusiast compacts like the Sony RX100 II. Even if you never remove the GM1’s kit zoom, the combination enjoys a lot of advantages over the Sony, which for me personally make it a more flexible and usable camera. Yes I’d miss the RX100 II’s hotshoe, tilting screen and longer zoom, but again the GM1’s low light AF and powerful feature set, not to mention superior image quality in my tests, makes it my preferred choice of the pair. I may need a thicker pocket to accommodate it, but I’d say it’s worth the squeeze. Great image quality, as good as the Lumix GX7. Fast AF which works in lower light than most cameras. Touchscreen lets you tap to focus for stills and movies. 1080 movies with 24p, manual exposures and peaking. Timelapse, 7-frame AEB, HDR modes, lots of effects. Built-in Wifi with smartphone remote control. Silent shutter option with maximum speed of 1/16,000. Small, light kit zoom with 24mm wide angle and good quality. Compatible with extensive Micro Four Thirds lens catalogue. Other lenses may prevent tripod use. Rear control wheel easy to press when turning. No 1080 video at 50p or 60p. No hotshoe nor means to mount viewfinder or mic. Modest battery life and no USB charging.